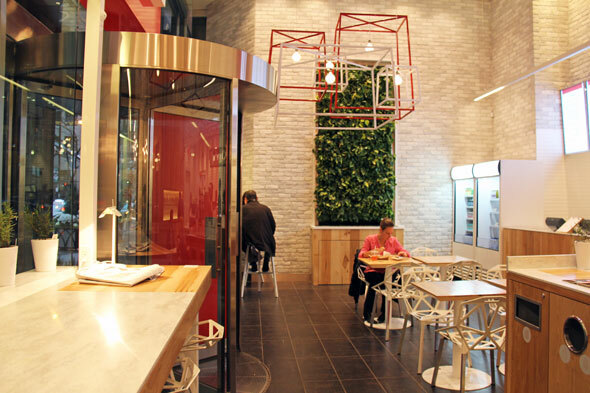 IQ Food Co. (Bay St.) has been open just over a month, and although it mostly shares a menu with its original location at Wellington and York, the ground-level, high-ceilinged space is a definite upgrade. The original location is in a subterranean food court, and despite the unflattering fluorescence and generally depressing food court atmosphere, it's seen steady traffic during its rather limited 11 a.m.-4 p.m. business hours. 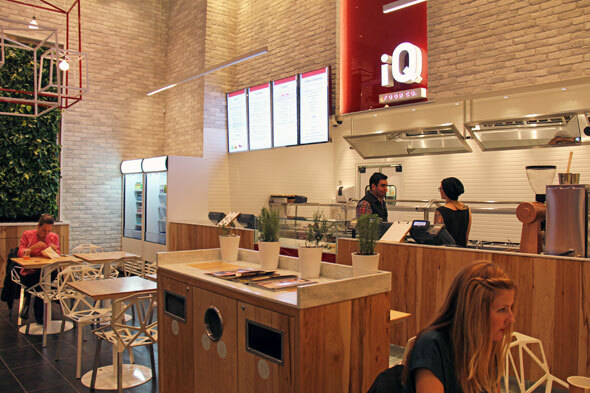 Steady, even following a rather disparaging expose earlier this year on the true nutritional value of its purportedly healthy meals--nevertheless, even a slightly more-caloric-than-advertised meal at IQ Food is going to feel better than McDonald's. 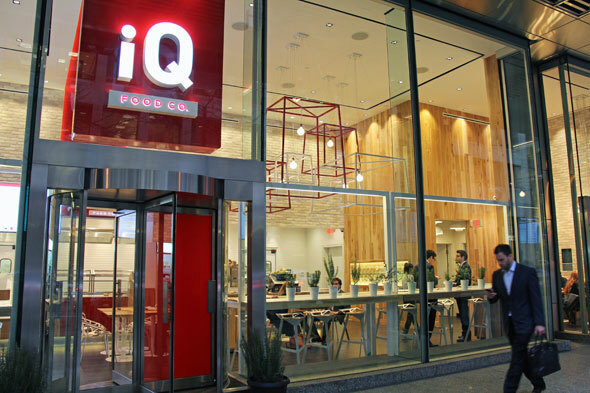 From the outside, IQ Food Co.'s second location suits its Wellington and Bay address quite nicely, with floor-to-ceiling windows, and a glimpse into the blonde wood-heavy interior which would be equally appropriate in a luxe bistro. The bar-style window-seating affords library-style reading lamps and international newspapers (although there are also more traditional tables), geometric art hangs from the ceiling, and men in suits abound. Particularly odd are the white bar chairs--riffing on the same minimalistic lattice theme as the art--which resemble plasticized doilies, and are fairly uncomfortable. 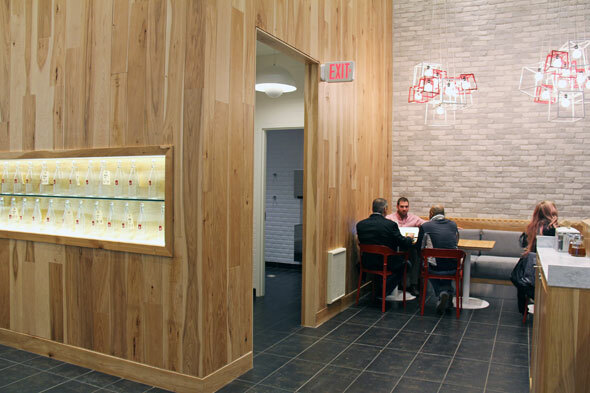 This location opens around 7:30 a.m., with a breakfast menu (available only in the morning) that features open-faced sandwiches with tasty dressings such as gravlax and figs, and granola bowls. Their closing time is still in flux. Otherwise, the core menu is identical to that of its original location, but also adds a selection of coffee and espresso-based drinks, as well as herbal teas such as Yogitea and Kashmiri Chai, to its roster. Upon arrival, I'm surprised to learn that the albacore tuna advertised on their website (which I quite like, and tend to get excited for in a plebeian kind of way) has been replaced by salmon. Substitutions are available, and you can either spring for chicken or tofu. We start with their Med salad ($8.85), presumably a play on Mediterranean with its mix of spinach, sun dried tomatoes, feta cheese, kalamata olives, shallots, and a basil and citrus vinaigrette. It's lean protein--part and parcel of almost every menu item--is roasted chicken. What can I say? It's incredibly flavourful, but I remain skeptical that anything blessed with so much crumbled feta (a generous dollop of it) can honestly be called healthy. It would've benefitted from more sun dried tomatoes or yellow peppers--after all, people expect vegetables from a salad. 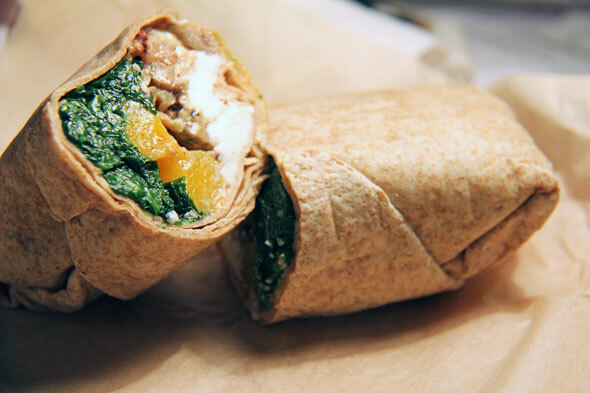 I opt for their seasonal wrap, a hearty, winter-appropriate blend of over-roasted mushrooms, butternut squash, spinach, goat cheese, pecans, and balsamic vinegar ($8.63), which is then grilled in a whole wheat wrap. The dominant flavours are, predictably, goat cheese and pecans, although that combination alone is rich and festive. The vegetables were rather bland (says the woman who upends an entire spice cabinet onto sauteed spinach), and the texture of the butternut squash was too soft for my liking. Our easy favourite is the Marathon bowl ($10.40 with brown rice, $11.28 with quinoa). It comes with oven-roasted salmon, but I exercise my right to substitute, and choose chicken instead. 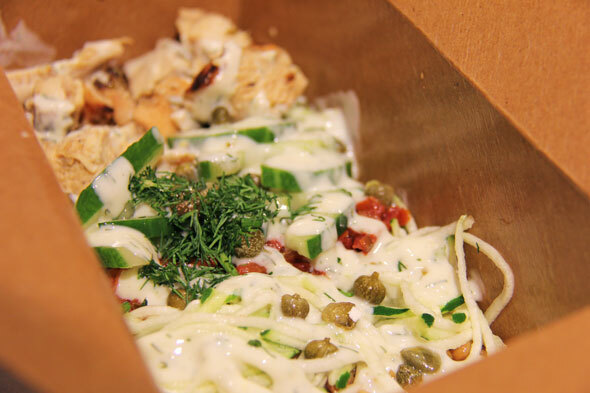 Something of a faux pas, as the pairing of cucumbers, capers, dill and a light lemon yogurt dressing would have been perfectly suited to fish, but the zucchini, sun dried tomatoes and lentils complement the chicken nicely. The zest of the dressing detracts from the heaviness of what is, essentially, beans 'n' rice, and I have to say that their chicken is well-spiced and perfectly-cooked. 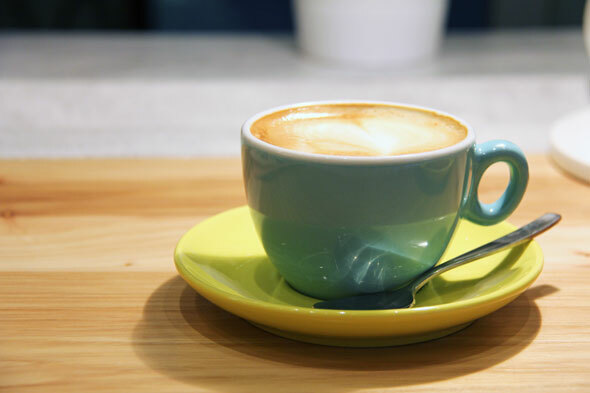 I try their cappuccino ($3.32)--nicely foamed, strong-tasting espresso--but I'm becoming overly-sensitive to the absence of simple lactose-free milk at cafes and restaurants around the city (read: not soy or almond milk, as they both change the flavor of the latte completely). Although the following might change, currently they use 49th Parallel 's coffee and espresso, and the latter is their Epic Espresso, a blend of beans from Guatemala and Panama. You'll also find baked goods--most of which are gluten-free, and use brown sugar--except for the one pictured above, because, well, I like both flour and white sugar. 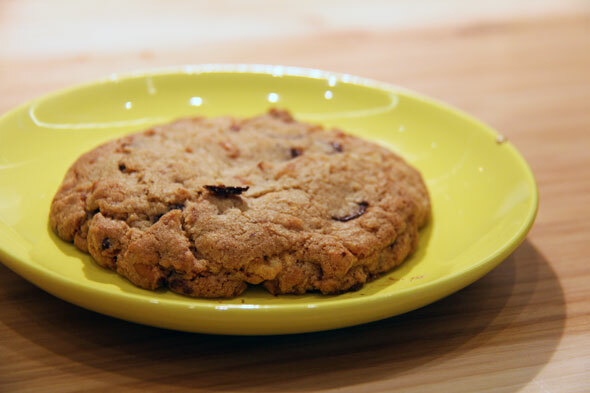 The Everything but the Kitchen Sink cookie ($2.65) comes dotted with bits of maple, thick chunks of chocolate, and an unidentifiable nut. Not as moist as one might hope, but by late afternoon, it's not surprising.